I hope you have some water, whether it's a stream or a lake, that you call your ‘home water.' Over the last half century I have had the privilege of fishing a lot of different places. I have fished most of the legendary trout water in North America, and many places that are only known by a few local anglers. Although I enjoy fishing different places, like Dorothy told the Wizard of Oz, there's no place like home. Home water may be a trickle of water running through a cow pasture populated by brook trout, a backwoods pot hole that is only accessible by a one track dirt road, or a lily pad covered lake filled with large-mouthed bass and crappies. No matter how big or how small, how remote or accessible, it's home and that's what makes it special. Over the years I have changed home water several times. In my youth there was a small creek that ran through the pasture on my parent's farm, and over time I came to know every undercut bank, every spring hole, and every riffle where a carefully drifted worm would produce a sparkling brook trout or even occasionally a real trophy, a brown trout. On this tiny stream, which I could jump across in many places, I received my grade school education in trout behavior. For several years I fished a small hidden lake that was only reachable by slogging through a quaking bog populated by a vicious band of mosquitoes and some of the biggest leaches I have ever seen. There, in a leaky old rowboat, I dangled minnows under a bobber for dinner-plate sized crappies, used worms to lure saucer-sized bluegills, and occasional hooked a respectable large-mouthed bass with a jitterbug or a rapala fished among the lily pads. 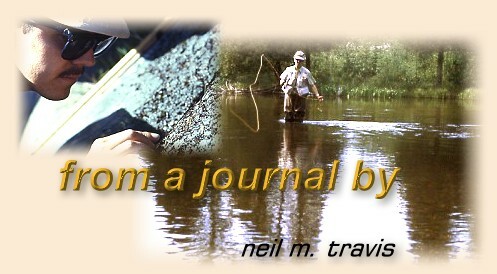 In my early adult years I started fishing the Au Sable River in Michigan, and for over a decade it was my home water. From the Mason Tract on the South Branch to the Holy Water east of Grayling I cast my flies to rising trout from early in the spring until late into the fall. Although it has been nearly 40 years since I fished it regularly I can still picture each place where I fished with such vivid clarity that it seems like it was only yesterday. The education that I received there and the memories that I made have enriched and colored my life to this day. Today my home water is a spring creek just south of my home in Montana. Ultimately convenient it is only minutes from my doorstep, and is populated with a healthy number of educated trout which continue to test my knowledge and skill. The wading is easy, which is more important now than it was years ago, the flies are small, which is more challenging for this senior citizen, but most important is that it's home.